Finding work at Rockford, Powell became steeped in the traditional culture of the Barossa as the idea of owning his own winery began to take shape. David was saddened by the vinous devastation caused by the mid 1980s government sponsored ‘Vine Pull’ scheme. He became convinced that a market existed for old vine wines as influenced by the classic Rhône styles. Lacking deep pockets (but inspired nonetheless), he set about approaching local landowners concerning their neglected properties. Powell began to discover and clean up a few sections of dry grown old vines and was able to secure a contract for the supply of grapes from a run down but ancient Shiraz vineyard. He managed to raise enough money to share farm the vineyard, a practice which involves paying the owner a percentage of the market rate for his grapes in return for totally managing the property. Dave nurtured these old, lifeless and overgrown vineyards in his spare time. Near lifeless, he brought them back to health and was rewarded with small parcels of fruit which he made into wine. Bringing the old practice of share farming back to the Barossa subsequently secured for him a regular supply of fruit from the best Shiraz, Grenache, and Mataro vineyards, including a few hectares of what are thought to be among the oldest grapevines on the planet. In return for his equity of toil and sweat, Powell’s efforts were rewarded with a few parcels of dry grown fruit, and he turned these wages into the first bottles of Torbreck. As the first vintages lay in barrel, Dave thought back to his experiences overseas and realized that the growers of the Barossa Valley had overlooked the suitability of the French white Rhône varieties. Powell purchased 30 acres of land in Marananga in 1994 for the purpose of planting Marsanne, Roussanne, and Viognier. Shiraz was included in the mix in what is now known as the Descendant Vineyard, also the site of the new Torbreck winery. In 1995 Dave crushed three tonnes of grapes and fermented them into wine in a shed on his 12-hectare Marananga property. He named his wine Torbreck after the forest in Scotland where he worked as lumberjack. Other acquisitions (included a one hundred year old vineyard that had been previously share farmed) soon followed, and Torbreck continues to follow the path of sourcing the best fruit possible from its own vineyards and those of select growers. It can be said that the Torbreck portfolio offers the best of both worlds, old and new. 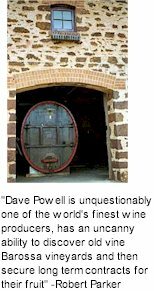 Powell is a passionate believer in the Barossa Valley and its viticultural heritage. Dave loves the intense, rich, Rhone-like flavours that come from old vines. His approach to grapegrowing and winemaking melds the region’s terroir with its traditional winemaking practises. In so doing he has achieved a style that fuses his love for the Barossa with his admiration for the valleys of the Rhône. In July 2002 the historic Hillside property was acquired by Torbreck. Situated in Lyndoch, it is one of the original Barossa properties. Vast and picturesque it contains some magnificent old and ancient vineyards that will further the source of premium quality fruit. The Hillside property contains a wonderful native ecosystem that supports a myriad of flora and fauna which Powell intends to turn it into a nature reserve. An original settlers hut has been lovingly restored as the winery cellar door and provides a personal touch with some Barossa warmth. A new winery and administration facility was completed on land acquired from a next door neighbour. 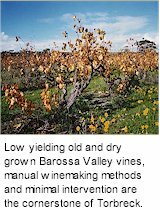 Complete control of all aspects of production have seen a new benchmark of wine quality established by Torbreck in the Barossa.